April 7, 2008. Around noon, this gigantic sand devil forms over a field in Poederlee, Belgium. While on the look out for fires, forester Jan LAMBERTS took this photo from the watchtower in nearby Herentals. 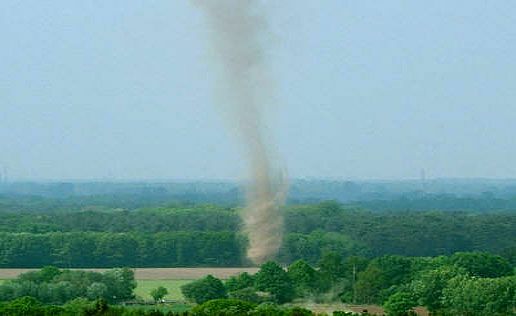 The whirlwind remained stationary for about 15 seconds, taking up lots of sand and dispersing it high in the air. This large funnel was preceeded by several smaller whirlwinds.